The aging process takes its toll on the entire face, especially the mid-face and cheek region. As we grow older, the skin and fatty tissues that drape over the cheekbones begin to droop or sag. Unfortunately, this can create an unattractive and tired appearance underneath the eyes, around the nose and mouth and into the jawline. To restore the sagging cheek tissues to their most youthful position and revitalize the face, a cheek lift may be recommended. A cheek lift, often referred to as a mid-face lift, can be performed with minimally invasive face and neck procedures that involve less pain and quicker recovery than a full, traditional facelift. Dr. Harirchian uses advanced surgical techniques to address the upper cheeks, lower cheeks or both. Depending on the type and severity of your concerns, she can perform a cheek lift using the valued deep plane lifting technique or an endoscopic cheek lift method. An endoscopic approach is ideal for younger patients that simply want to accentuate their cheeks or those that do not have significant concerns with their lower face, jowls or neck. However, a deep plane lift should be used to effectively address the upper and lower cheeks as well as the neck. During a cheek lift, the cheek fat pads that have descended with age are delicately repositioned over the cheekbone to create a more youthful and rejuvenated appearance. When choosing cheek lift surgery at our Houston plastic surgery center, you can trust that Dr. Harirchian will pursue ways to make your experience as comfortable and rewarding as possible. 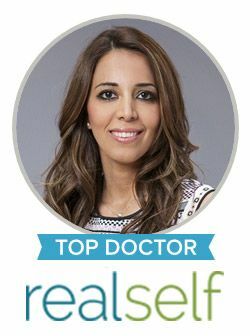 She is dedicated to using the latest, most innovative surgical techniques available, including those that involve inconspicuous incisions and produce the most natural and sustainable results. We recognize the unique concerns, goals and budgets of each patient. Therefore, we value a tailored approach in cosmetic surgery to accommodate your needs. For more information about cheek lift surgery or to schedule your consultation, please contact Dr. Sanaz Harirchian in Houston today.